Photo printers can be a real pain when it comes to ink cartridges, with up to nine different individual cartridges to change in some of today's top models. By contrast, the Lexmark X3480, which is available exclusively from PC World, Dixons and Currys, uses a single cartridge that includes cyan, magenta and yellow inks. On top of that, it has a built-in colour scanner, PictBridge port and a multi-format card reader, which can accept SD, MMC, xD, MS and CF cards. 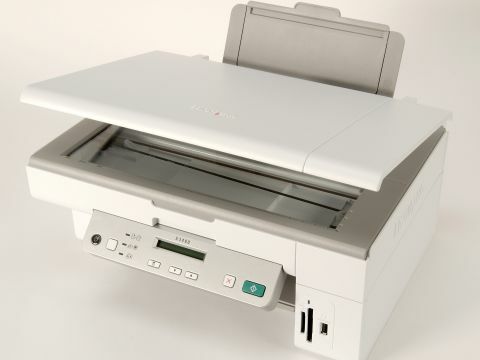 All of this is brought together via a simple and intuitive set of onboard controls and menu system for standalone photocopying and photo printing. The main trade-off for having a single ink cartridge is that black has to be produced up by mixing all three of the ink colours. Not only does this make mono printing very slow and expensive, but also means that black text that is printed has a faded, greyish appearance. Results are disappointing, to say the least. Switching to photo printing, we managed to get 10x15cm glossy prints in around three minutes and 40 seconds which, again, is very slow when you consider that many current models from competitors such as Canon, Epson and HP complete the same task in less than a minute. More concerning is the fact that the colour space enabled by just three inks is very limited. While the Lexmark made a surprisingly good job of reproducing Caucasian skin tones, darker skin as well as shadows and other lowlight areas of photos had a decidedly washed out appearance in our tests. Another annoyance is that you can't print full A4 photos from memory cards, because the control panel options limit you to printing 10x15cm prints, either singly or as multiples of two on an A4 sheet. At least you can also print pages of multiple thumbnail or 'proof' images. Mono and colour A4 photocopies both took the X3480 around 40 seconds to complete, which is reasonably swift for colour at least. The scanner side of the equation also turned out to be pretty good, with high levels of sharpness and fairly accurate colour rendition.